Tasting Notes The Dry Creek Valley Cabernet Sauvignon is vibrant with aromas of currants, dried cranberries, black cherry, and a beautiful higher-toned spice. The aromas come to life on the palate with tastes of tea leaf, cedar, and cacao nibs. A nice minerality complements the lively finish. This wine will age beautifully. Production Notes The grapes were picked at dawn in a cool fog and were brought immediately to the winery. There, the grapes were sorted, destemmed, then the berries were sorted again before being put into the small stainless steel tanks for fermentation. The grapes were cold soaked for five days before fermentation to allow for some natural color and phenolic extraction. The wine was then fermented and allowed to sit on the skins post fermentation for two weeks. They were then pressed and put into barrel where they underwent malolactic fermentation, then were gently racked off of their heavy lees and put back in barrels where they sat in the cellar to age for the better part of two years. Food Pairing The Dry Creek Cabernet Sauvignon from Flambeaux Vineyard sings with a beautiful ribeye – the vibrant fruit and minerality in the wine perfectly balances the richness of the cut and this interplay evolves as the meal goes on. About Flambeaux Wine Flambeaux are the dancing torchbearers of New Orleans Carnival. For a century and a half, they have illuminated the New Orleans night parades, dancing and twirling their torches so as to cast a magical, flickering light over the spectacle. To many New Orleanians, the Flambeaux are the quintessential symbol of Carnival, representing tradition, light, dance and most of all, joy. 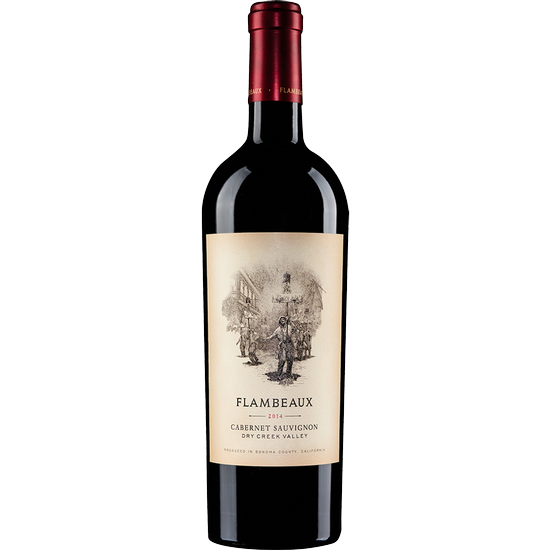 We have named our Cabernet Sauvignon after this time-honored symbol of our native New Orleans, as the Flambeaux best represents all that we love about Cabernet-light flickering in a dark glass, complex flavors dancing across the palate, and celebration of life.